Is Buhari Under Foreign Pressure Not to Seek Re-Election? Abuja — The presidency Tuesday deplored a report that some foreign powers were mounting pressure on President Muhammadu Buhari not to seek re-election in 2019. 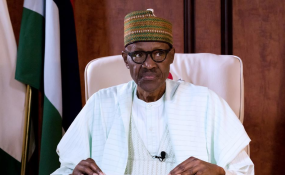 A national daily (not THISDAY) had on Tuesday reported that notable countries like the United States, United Kingdom and Saudi Arabia had been mounting pressure on the president to shelve his re-election ambition. But in a swift reaction, the president's media adviser, Mr. Femi Adesina, described the story as a fiction, insisting that those countries are democratic nations that would never interfere in the operations of another country. According to him, contrary to the report, it is rather such mentioned countries that have thrown their weight behind Buhari in appreciation of leadership he has provided in Nigeria. "It is necessary to respond to a tendentious story published today as cover choice by Daily Independent Newspaper. "Under the headline, 'Pressure mounts on Buhari not to seek re-election,' the fiction parading as news claims that foreign powers, including the European Union, United States of America, United Kingdom, and Saudi Arabia, are putting pressure on President Buhari not to seek re-election, due to some concocted reasons. "We thought fake news was the sole preserve of the social media in this season. Alas, a traditional medium has caught the bug. Obviously, the author of the story just got a brain wave, or got procured by anti-democratic elements, and then penned the mischief. "If there are quarters in which President Buhari is held in very high esteem, and the work he is doing for Nigeria highly lauded, it is in the countries mentioned. "Some of them are equally bastions of democracy, and will not interfere in the democratic affairs of a sovereign country. The newspaper should simply tell its story to the marines. President Buhari is not a flippant or frivolous individual. He gave deep thought to the prospect, before announcing his bid for a second term in office. "It is only those who fear that their goose would be cooked, if they meet with him at the polls, that are trying to dissuade him from running by all means, including sponsored newspaper stories. "By saying it got feelers that President Buhari may opt out of the 2019 presidential election, Daily Independent embarrassed itself, and all those who love good journalism. The newspaper can surely do better."